British Airways Concorde G-BOAC "Alpha Charlie"
Information on how to download this Concorde screensaver. 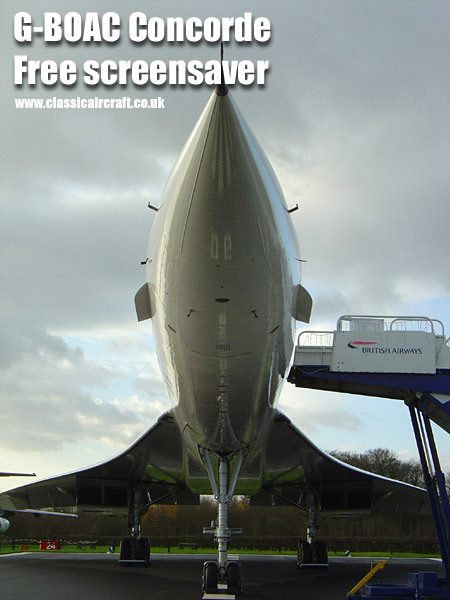 This Concorde screensaver is designed to work on most PCs out there, running Windows. It has been tested on XP, and feedback suggests it also works fine on other versions. If however you are not confident about altering your PC's configuration in any way, please seek advice from someone who knows about computers before attempting to install this. It is fairly straightforward, but I can't take responsibility for users altering their PC setups and any resulting issues or quibbles. No guarantees, warranties or promises that it'll work on every flavour and vintage of machine out there! Right, to install this, do the following. Click on the concorde.exe or concorde_7.exe link in the righthand column. The main concorde.exe contains all 15 images (1.34Mb), and the cut-down version concorde_7.exe just 7 of these G-BOAC pictures. When prompted, save the file to your machine's hard drive, and make a note of where you saved it off to. Using Windows Explorer, locate the .exe file and double click to run it. A grey window will open, allowing you to preview the s/saver before installation. Click Run to preview the s/saver, and Install to apply it. The G-BOAC s/saver will now be your default - you can replace it at any time via the Display section of your Windows' Control Panel. The photographs featured in this screensaver were all taken by myself at Manchester, now home to retired Concorde registration G-BOAC, or "Alpha Charlie". Supersonic passenger flight is no more, and British Airways is now just another airline, operating bland, faceless aircraft, just like all the rest. At one time, BA (and Air France lets not forget) stood out from the rest, operating this stunning aircraft as their flagship service, identifiable by even those who have no interest in aviation per se. That has gone now, despite the best efforts of Mr Branson to keep one or two supersonic jet airliners in service. The country is that little bit more dull as a result.